A right turn in Tsamakasar leads to Zarnja, in N part of which is 7th c. S. Khach church, rebuilt in the 10th c.
other building inscriptions indicate that the bulk of the church is 7th century with later repairs. According to popular etymology, Mastara derives its name from Gregory the Illuminator, who brought back from Caesaria the relics of John the Baptist, one fragment of which he enshrined beneath the church site: Mas (a piece), Tara (I buried). The church was closed in 1935 and used as the collective farm storehouse until it was reopened in 1993. 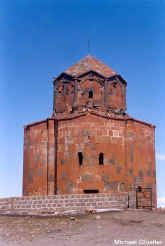 S from S. Hovhannes church, among the houses is standing the small chapel of S. Nshan. The village is very rich with different khachkars, among of which is the Mastara Large khachkar of the 13th century, one of the bests in Armenia, standing on the SE edge of the village, on a hill, seems to be a prehistoric settlement with traces of fortification wall. Just on the right is standing another beautiful khachkar, occupied with interesting shaped gravestones. 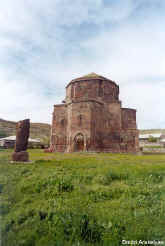 Series of beautiful khachkars and gravestones (including modern ones) with a ruined chapel, are standing in the cemetery of the village. NE from the village, atop of a hill is the famous Nakhavka (or Naxavik) shrine and fort remains.